To view your customers, head over to the Customers section from the main nav. SimpleSat will show all customers who have left feedback for your company. The list is sorted by latest feedback given. 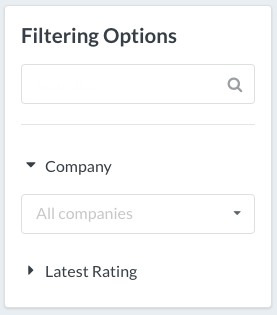 To drill down and find specific customers, use the Filtering Options menu on the left. To browse all customers, scroll to the bottom of the list. 20 customers will load each time you get to the bottom. Click on a customer's name to view detailed satisfaction information. 📖 Learn more about viewing individual customer details.